Intel has unveiled more performance numbers of their upcoming Xeon class, Cascade Lake-AP or Advanced Performance processors. 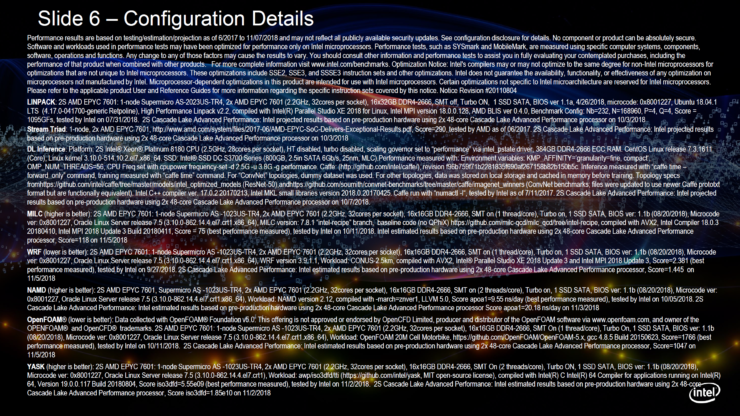 The new processors were announced by Intel last week when they promised to give out more details at Supercomputing 18. 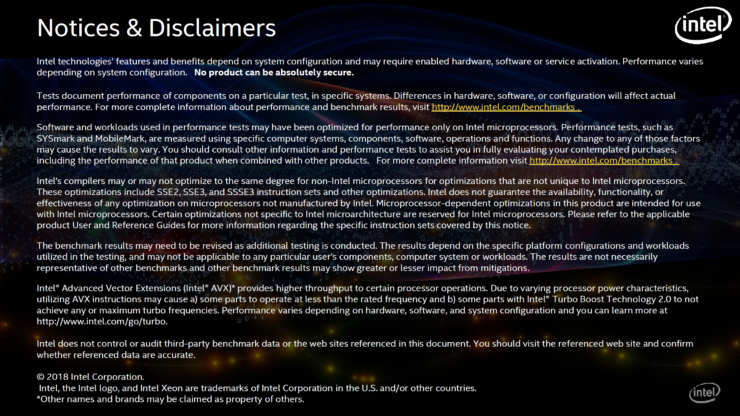 It looks like Intel is now presenting us with even more details, although most of it was actually announced last week. Last week, Intel announced that the Xeon lineup would be getting a new premium line of chips under the Advanced Performance moniker. The first processors in this lineup would be based on the Cascade Lake architecture and as such, use the Cascade Lake Advanced Performance naming scheme. These processors will be packaged in an MCP (Multi-Chip Package) design, featuring up to 48 cores and 96 threads per chip. The processors will also support 12 DDR4 channels, offering support of very dense capacity DIMMs and Optane DC memory. Last week, Intel showed us preliminary performance numbers that were taken from a 2 socket server, featuring two 48 core chips which mean a total of 96 cores and 192 threads. The 12 channel memory will give a total of 24 DIMM slots and considering you can fill that up with some really dense ECC memory, we will be looking at up to 3 TB of memory support. In addition to ECC memory, the new Xeons will also support the Optane DC Persistent memory, featuring capacities of up to 512 GB. 24 of these in the 2S server would give a mind-boggling 12 Terabytes of system memory. This would deliver an unprecedented amount of memory bandwidth which is only possible through a CPU in the class of Cascade Lake-AP. The performance results are mentioned below. Do note that the results are based on pre-production hardware so we are most probably looking at results based on early engineering samples. 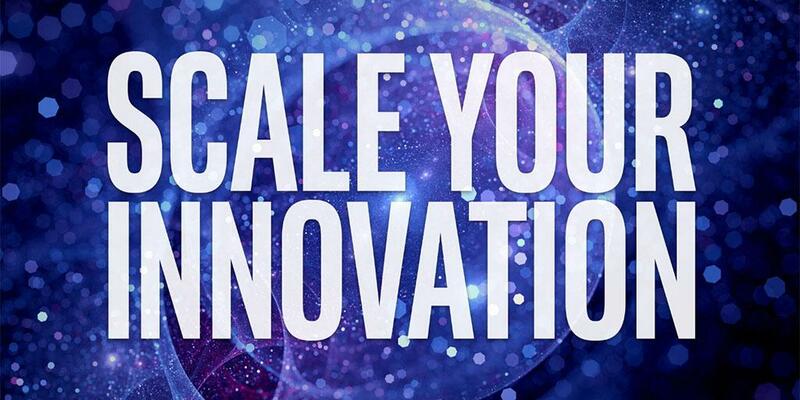 What Intel Disclosed at Supercomputing 2018: At Supercomputing 2018, Intel disclosed new performance results for next-generation Cascade Lake advanced performance processors, a new class of Intel® Xeon® Scalable processor designed to support converged high-performance computing (HPC) and artificial intelligence (AI) workloads. 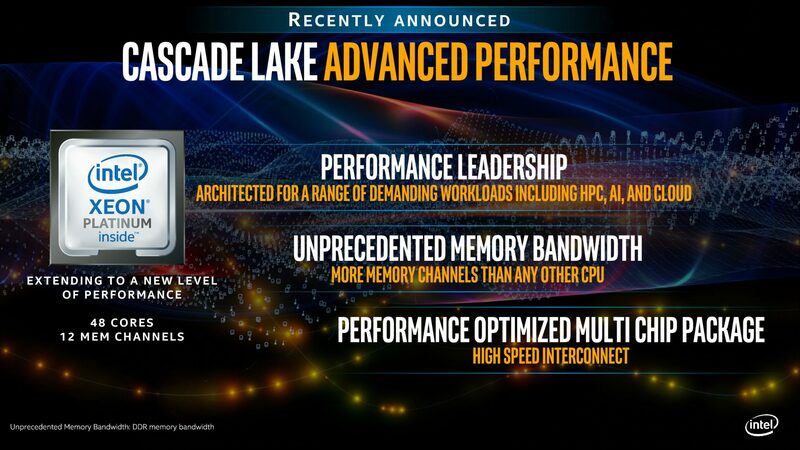 Available in the first half of 2019, Cascade Lake advanced performance processors are designed to accelerate applications in the fields of physics, weather modeling, manufacturing, and life and material science. The processor features Intel® DL Boost technology, which improves AI/deep learning inference performance by up to 17 times1 compared with Intel Xeon Platinum processor measurements at its 2017 launch. The North German Supercomputing Alliance will adopt Cascade Lake advanced performance processors in its next-generation supercomputer to enable significant computation gains and improved efficiency. 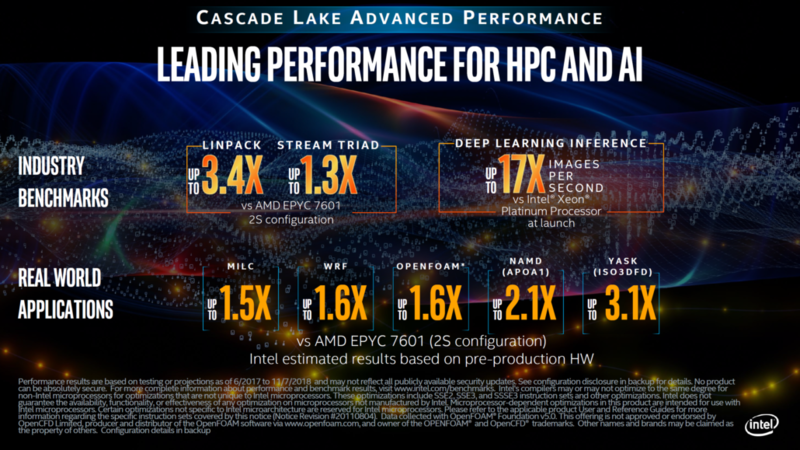 Several OEMs have also announced intent to support Cascade Lake advanced performance, including Bull Atos*, Colfax*, Cray*, HPE*, Inspur*, Lenovo*, Megware*, Penguin*, Quanta*, Sugon*, and Supermicro*. We can also tell that the platform is of a way different design compared to Purley which houses the Skylake-SP and will house the upcoming Cascade Lake-SP Xeons. We can probably be looking at a different socket which was rumored to be the BGA 5903 and hence, a different platform will be shown. The new Cascade Lake-SP Xeon CPUs will be shipping in early 2019 and we can expect the Cascade Lake-AP Xeon CPUs to ship close to them. Intel hasn’t confirmed the launch date but we will let you know once we have more details. Launch 2017 2018 2019 2019 2020 2020?